At Bernick's, we carry hundreds of products. That's a well-known part of our service - portfolio versatility. Our customers and consumers represent both a broad and large variety of every niche and scope. With that comes the opportunity to be associated with some great brands who have great stories - just like Duluth Coffee Company - an artisanal coffee roaster from the city of the same name. 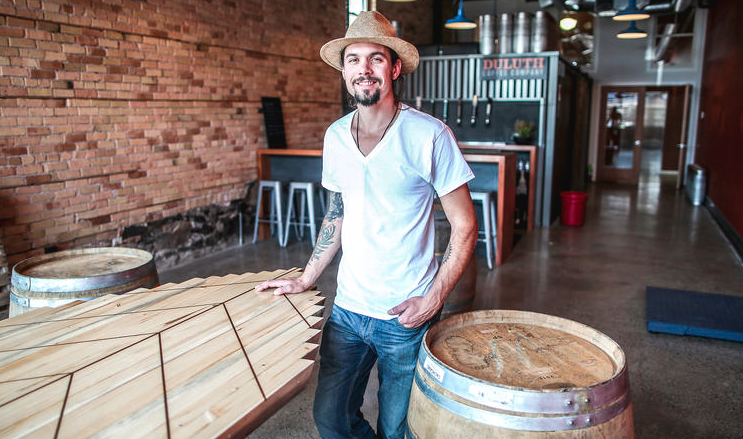 Sam Levar is Duluth Coffee Company's sales manager. He shared the brand's background and foundation beginning with, of all things, an air popper ... and a straw hat. "Eric Faust is our founder and owner. He started roasting at a really young age on an air popper, which is how a lot of roasters get their start. He got his start in this industry by playing around and getting to know it. He shifted capabilities to a 1-kilo roaster machine, which processed two pounds of beans per batch. Still very small scale. Then he got a three-kilo machine, which turned out five pounds per batch and installed it in his Hermantown garage. What Eric loved about the coffee industry was how interconnected it was to people. On the flipside, he didn’t like how it wasn’t very transparent or open to the source of the beans – to be specific, single origin - something we stand behind today. From the beginning, when Eric started this company, he wanted to be different. A different brand, a different style, a different employer." Sam continued, "Sourcing from one single origin – or one single farm - means you have more impact or influence on the bean's quality vs. the coffee being blended – or baited with flavors. Eric couldn’t align his vision with any roaster at the time who was focused on a single origin. Take for example a Colombian blend – that coffee could be 90 percent Brazilian only, with rest being some other origin. The coffee industry is old – thousands of years old – and very unregulated. The importers do most of the regulation and organizing themselves. Most of it is ethically sourced but there still remains a few bad apples in the industry. And sometimes, those bad apples are the huge companies who do it, and they're doing it simply to cut costs." When Eric started roasting, he was selling the beans wholesale at farmers markets in the Duluth area. Sam said, "Eric was selling coffee out of the back of his pickup truck. He'd wear his straw hat and drape burlap sacks off his tailgate. He landed a few cafés and coffeehouses that way, and one of our first accounts was Red Mug Coffeehouse in Superior, WI. Another early customer was Lake Avenue Café in Canal Park. It was small, organic growth just through relationships Eric was making. He started the business wholesale. He didn’t start via a café approach. He wanted it to be B2B (business-to-business). Our location at 105 E. Superior Street opened in 2012 and was always intended to be a roaster center – with a spot to sample the coffees being roasted at a counter. It was never about a full-scale coffee shop. But again, that organic growth and buzz about what we were doing led to a busy, highly trafficked coffee shop anyways. There were lines out the door. That was the biggest marketing tool for us. It was a way to communicate with our local market, and spread the message of what Eric was doing. And, he was still doing it on a three-kilo roaster, five pounds at a time." In 2012, Duluth was different. The same can be said for any metropolitan area, but downtown Duluth was … dire. Sam explained, "There’s been this massive change with Blacklist Artisan Ales replacing the Last Place on Earth, the NorShor Theater renovation, and the Fond-du-Luth casino project. It’s been revitalized and cleaned up. It's just a huge change in the atmosphere, vibe, and attraction quality of this city. As time wore on and Superior Street got busier, the three-kilo machine wasn’t cutting it. We installed a 12-kilo machine in its place and transferred the 3-kilo machine to a family in Chile. Eric knew a family from Minnesota who moved there, and he helped install the machine at their new home – and they still roast on it today. They send us a batch of coffee every now and then from the roaster that got us here. That's a pretty cool thing," Sam said. Sam continued, "We relied on the 12-kilo roaster (which batches beans 22 pounds at a time) for about three years. It got to the point about 18 months ago that Charlie [Comnick], our head roaster, was roasting four to five days a week, about 10 hours a day just to get the coffee out the door to meet demand. And that was nearly all wholesale. 90-10 percent or 80-20 percent was the split on what we were roasting to package and sell vs. serving in our café. The wholesale side of our business is, and always has been, our bread and butter. On top of the roasting production schedule, we had to drive our own cars around to drop coffee off at our accounts. And, we were hand-bagging it. Each of the coffee bags was hand stamped by Warrior Printress in Duluth. We’d put a sticker on them, and three stamps on the back. Of every single bag. So … it took forever." "At that point, we knew things had to change. We either needed to cut things off or look at alternative ways to facilitate growth. We knew we wanted to continue influencing single origin coffee. Instead of being one of a coffee farm’s customers, we could be its sole customer. That was our driver. How could we get our coffee into more people’s cups? How could we spread the single origin movement – and share what good quality roasting is all about?" Sam said. Eric and his team at Duluth Coffee Company started to think expansion and adding a second location. Sam added, "But even then if we increased our roasting capacity, we still had the packaging and distributing obstacle that would scale right along with it. In January of 2017, we partnered with Twin Ports Paper & Supply to handle the packaging of all of our coffee. (Our coffee bags, intentionally printed on craft paper, have a cool story too – they’re actually painted with coffee). And, we joined forces with Bernick’s for distribution. They have the fleet and expertise when it comes to getting product into the hands of customers and consumers." With packaging and distribution sourced, Duluth Coffee Company made the move to an American-made 70-kilo roaster which greatly increased its capacity. Next, they officially opened a new roasting space two doors down called Duluth Coffee's Roastery on the corner of Superior Street and First Avenue East. In comparison, the new, massive roaster can yield about 150 pounds of beans per batch. In addition to the volume increase, the amount of time efficiency increased. Sam explained, "Our 12-kilo machine took about 12 minutes a batch, and we’re getting about 11.5 - 12 minutes per batch on the 70-kilo too. You’d think the larger volume would take more time per roast, but that’s not the case. It’s an incredibly powerful machine – and we have a 90-kilo cooling tray that ensures everything is rotating properly. You have your green coffee in the top hopper, roasted coffee below, and cooling coffee in the tray. Now, our production schedule has us roasting on Mondays and sometimes, into Tuesdays. That alone is a big change from our previous five-day a week schedule. And we’re not bulk roasting to stockpile coffee, we’re keeping the quantity on par with our distribution schedule. The coffee that leaves our roastery is fresh. We fill big brew bins full of coffee and Twin Ports Paper & Supply picks them up on Tuesdays, transfers them to its warehouse in Duluth’s Airpark, and packages the beans at that facility. It’s incredible to see the quantity that now goes out from our 70-kilo roaster compared to what our original 3-kilo produced. One bag at a time, one bean at a time." Sam added, "We still have the bike and B.O.B. trailer we first used as our official delivery mode of transportation. It used to hang in the café. We will always remember where we started and what it took, and we’ll continue to pay homage to that." Sam explained scaling the business to account for the added partnerships and relatively new distribution model. He said, "We focus on what we do best, not on what is on the fringe of the business. Sourcing and roasting is our core. Another big process is the craft – and that’s our third element. It’s a vague term, but it’s also synonymous with the Duluth area. That craft for us is cold press. What this 70-kilo machine has enabled us is the time and energy to develop cold press – and make it the future of Duluth Coffee Company. It's cold press and conditioned nitrogen-infused cold press coffee. We keg that in six-barrel kegs and Bernick’s distributes those for us. It’s a standard keg that hooks into a kegerator or walk-in cooler and runs on 100 percent nitrogen." "There are statistics out there that cold coffee will surpass hot beverage by 2020 and it’s incredible to think about – daunting, but incredible. The convenience factor is what this trend is all about. I travel enough to know how easy – and preferable maybe – it is to grab something off the shelf vs. waiting for something to be brewed. The options are endless for cold press." He continued, "We like to experiment and try things out – yesterday we cold pressed a barrel aged coffee. We have an oak whiskey barrel we put green coffee in for three months and roasted it. It was tough to roast it due to the moisture that was pulled in from the barrels, but it was fun. It resulted in a boozy coffee drink. It smells and tastes fantastic. In the future, we’ll begin experimenting further with dosing and dialing back on the flavors. Peter Mack is our craft guy here; he was one of Bent Paddle Brewing Co.’s original brewers so he knows what it takes after stints at both Rock Bottom Brewery and Town Hall. He’s a career brewer, and now he’s brewing with coffee. Coffee and beer have a lot of the same principles and many that are different. He’s experimenting with natural sweeteners like honey and maple syrup and even cold pressing with sap." Sam took the coffee and beer comparison further. "Right now, we’re only about a year young with kegging our coffee. We have such great growth potential. Cold press is great because it’s NA (non-alcoholic); it’s for anyone. It can then be crafted and curated for a wide range of people and makes a great base for a cocktail or other beverage. We’ve done a lot of coffee and beer collaborations and we hope to continue that. 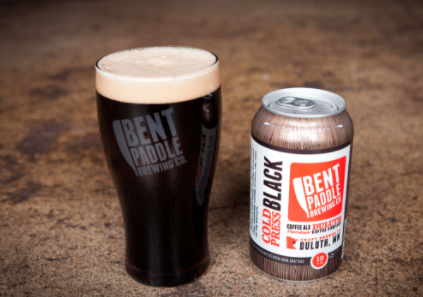 We have the Cold Press Black Coffee Ale at Bent Paddle Brewing; it’s one of their flagships and top sellers. Other breweries include Twin Ports native Hoops Brewing, Earth Rider, and Fair State Brewing Cooperative in Minneapolis. As people continue to become acquainted with coffee beers, demand will drive distribution. The consulting, training, and general coffee knowledge side of the business is also important to Duluth Coffee Company. Sam shares, "We started offering open 'cuppings' to the general public on Thursday afternoons. We want anyone and everyone to come in and taste coffees with us. Our goal is to engage customers in the complexities of coffee and how it's different depending on the origin and depending on the roast. Our goal is to encourage people to stop ordering coffee simply based on the roast, and instead ordering based on the origin. It’s just like wine or cooking a great steak; it has a lot more to do with the final product than the process itself. Roasting is about making the coffee bean better and not ruining it. We source some of the best green coffee in the world – and it could be ruined by over-roasting. It’s about understanding coffee at that scientific level on the roast. That’s where Charlie dives in – the complexities of the thermodynamics of coffee, when to drop it, and when to develop it. It’s fun to get different flavor profiles by working with the bean’s characteristics." Sam echoed that. "The line of communication from Bernick’s has been incredible. My role specifically was created to work alongside our distributor to make sure that communication is happening, is consistent, and is focused on education and continuity. I can join their team on sales calls and account visits to ensure a full-circle experience for customers. Those relationships are everything and building upon them is critical. Again, it's seeing how we can impact people, from origin to cup. The cuppings are about that. And, that’s an integral part of working with distributors - the education part that comes with our product. It’s about more than coffee. It’s the experience. We can’t ask our customers to just carry our coffee – they have to be part of it. This enables them to think about it beyond the cup – beyond the standard industry visualization of roasted coffee beans and latte art. We can share photos and videos of the farms and crops and the picking process. We can show them the cherries – and how green coffee looks from inception." Todd added, "So much of what Duluth Coffee Company is doing matches our own core values at Bernick’s. Recently (COO) John Torgerson shared in our internal communication the importance of relationships, specifically customer relationships and how our service is a three-pronged approach. Bernick’s, Duluth Coffee Company, and our mutual customer. Sam agreed. "That’s important to us, too. We still remain interfaced with the customer. I still and will continue to drop in on our customers, though I’m not delivering or making a 'service' call. It’s a genuine maintaining of our relationship, and showing face on their turf where our product is being offered. 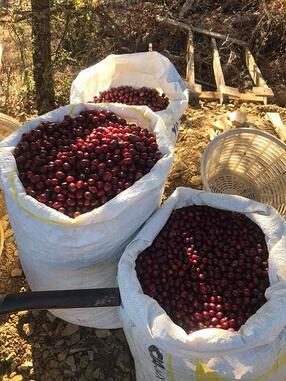 I like to take those opportunities to update them on production, source trips, and new photos of coffee cherries we’ve procured. It’s a next-level based relationship. And, that relationship is part of the bigger picture. Sam concluded, "Local connections and local vibe. We're part of the talk about the future of Duluth - where the city is heading and how we fit into that. We’re happy and proud to be part of this community. We call what we're doing mind share instead of market share. We want people to think of our brand as synonymous with good coffee, good people, and a good origin story." Beginning this spring, look for artisan, single origin coffee from Duluth Coffee Company in the Twin Cities-metro area at select grocery stores and on tap at bars, café, and restaurants.